Athletes wade into the water off of Sugar Pine Point at the start of the Lake Tahoe Triathlon last year. More than 600 people participated in the Lake Tahoe Triathlon at Sugar Pine Point State Park this past Saturday and Sunday. 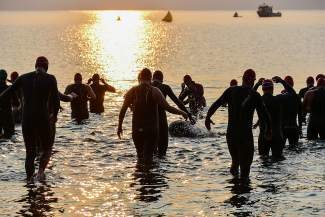 The event featured multiple race distances, including a Half-Ironman distance, an Olympic triathlon and Sprint triathlon, as well as a duathlon and aquabike. Truckee’s Donatas Ereminas, 33, who will compete in the full-distance Ironman Lake Tahoe triathlon next month, raced to victory in a field of 89 athletes in the Half. He covered the demanding course — a 1.2-mile swim, 56-mile bike and 13.1-mile run — in 4 hours, 26 minutes and 37 seconds. Mitchell Murphy, 28, of Reno finished second in 4:50:48, and Brett Long, 37, of Carson City was third in 4:55:39. Kris Klotzbach, 36, of Walnut Creek topped the women’s field and was 11th overall with a time of 5:09:29. She was followed by Janet Soule, 53, of Davis, who was 17th overall in 5:29:28, and Liz McLean, 31, of Napa, who was 23rd overall in 5:39:06. Tahoe Vista resident Adrian Tieslau finished 25th (5:43:45), while Incline Village residents Tony Lillios (6:13:20) and Nate Horvath (6:25:50) finished 40th and 50th, respectively. Tieslau and Horvath are also slated to compete in Ironman Lake Tahoe. Professional mixed martial arts fighter Nick Diaz of Stockton, who often competes in Tahoe-area triathlons, finished 36th (6:10:37). Just over 200 people raced the Olympic triathlon, which included a 1,500-meter swim, 24-mile bike and 6.9-mile run. Jonah Belk, 24, of Hanover, N.H., captured the win with a time of 2:28:37. Justin Rossi, 35, of Reno was runner-up in 2:32:22, and Brandt Champion, 25, of Berkeley rounded out the top three in 2:37:30. Truckee triathlete Sian Turner, 34, claimed the win in the women’s field while placing eighth overall with a time of 2:58:24. Erica Ruge from Cottonwood Heights, Utah, was the second woman and 13th overall in 3:04:52. She was followed closely by Samantha Shields of Truckee, who was 14th overall in 3:05:02. The Sprint was the most popular distance, with 295 participants racing on a course that included a 500-meter swim, 10-mile bike and 2-mile run. Sixteen-year-old Nicolas Brunet from Montalet Le Bois, France, took the win with a time of 49:51. Another 16-year-old, Jeremy Pond of Rocklin, finished second in 51:31. Pond also raced the Olympic distance the next day, placing sixth. Lee Guinchard of Livermore was third in 53:25. The top three women were Daisy Guinchard, 14, of Livermore, who was eighth overall in 58:23, Angela Raimondi of Sacramento (1:00:43) and Sydney Lewis of Rocklin (1:00:47). Find a photo gallery from the event at lefrakphotography.com. Complete results are available at laketahoetri.com.